We Incorporated in April 1964, and we are a locally owned and family operated lumber yard and hardware store. Supporting and helping to build and invest in the local economy of Lander, Ethete, Ft Washakie, Hudson and other local Communities in Wyoming for 52 years. . . . Carrying a complete line of lumber and building supplies to fill the needs of contractors, businesses, and home owners. 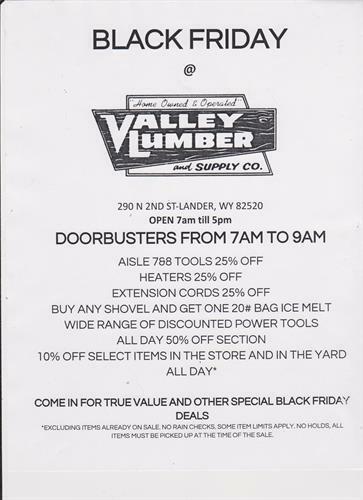 Valley Lumber will work with you on all projects, lumber, roofing, drywall, insulation, paint, siding, windows, doors, flooring, kitchen and bathroom cabinetry and design. . . .
We have a complete full service Lumber Yard on site, for construction and fine woodworking, and have the best yard guys Tanner and Rex to help select and deliver to your site. . .
We will help you with your project from the ground up, and help you with ideas, options, and support for your entire project. If we don't have what you need, we will find it for you. . . If you're looking for a great contractor, roofer, painter, or odd job individual, we can help you find just the right one. We work with many excellent local contractors with the knowledge to handle any building project you have. Having the right contractor with the right experience may be exactly where you need to start. . . . Working with True Value, your Start Right - Start Here, supplier we have a full line supply of hardware, tools, and gardening supplies. With monthly sales and specials always worth watching. Working with True Value we are able to extend excellent competitive pricing to our customers. Our staff Justin, Jason, Neal, Don, and Shawn will help!